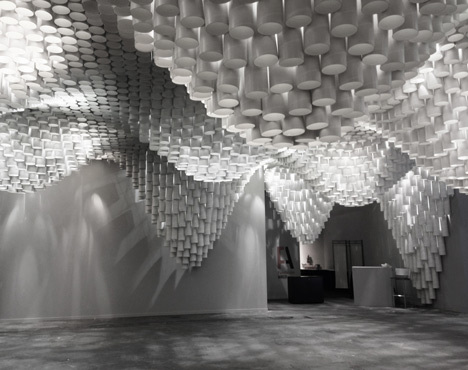 Visitors to the ARCOMadrid art fair in Spain last month were treated to a fantastic undulating canopy of paper tubes created by American studio Cristina Parreno Architecture and students from MIT. The white cardboard tubes were suspended from a wire mesh structure and the cables holding the tubes were cut to different lengths to create the varied topography. Lights were then fixed above the installation to shine down through the gaps in the tubes. This beautifully simple art piece is a fabulous demonstration of just how far you can go with lighting!